Group C in the Eurocup is all over bar the final jostling for positions and a lot of this is down to the poor form of the hosts. This game will provide Budocnost with a chance of redemption but coming into this game with a 0-6 record indicates that this is a team that has struggled so far this season. The hosts are also facing a team who are on fire on the road these days, having won their two most recent games. This may not be a night for surprises but there are basketball betting options to look out for. The home team is bowing out of the Eurocup and they have struggled for points all season. The team is classed as the lowest scoring team in the league with an average of 68.7 points per game, which tells its own story. The top scorers for Buducnost are Marcus Williams and Boris Savovic who both hold an average of 12.7 points per game. They are the only two players in the home side who have broken into double figures for the season. The hosts will be determined to give their fans something to cheer about this season but it looks like being another tough night for the Podgorica fans. Zenit are currently in second place in Group C but they’ll know that a win in this game will go a long way to strengthening their chances of at worst, holding this position, and maybe even giving themselves a chance to take top-spot in the group. Leaders Bayern Munich hold a 5-2 record and are resting this week so an away win would draw the side from St Petersburg level with the Germans and set up a final week where both teams know what they have to do. 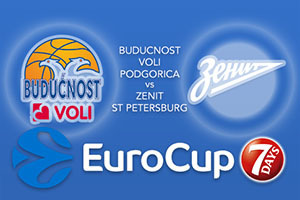 Zenit grabbed an 84-79 win over Buducnost when the sides last met and they’ll be confident of a win here. Ryan Toolson is the top scorer for the away side so far this season, offering up an average of 24.4 points per game. The away side should have enough to take control of this game and you can back Zenit St Petersburg at -7, which is on offer at odds of 1.90. If you’re looking for the Over/Under market, choose to go OVER 163.0 at odds of 1.90. Bet Now!